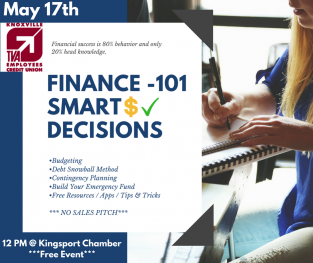 KINGSPORT, Tenn. - May 10, 2018 - PRLog -- The Small Business Development Center ETSU – Kingsport Affiliate Office will host Finance 101 – Smart Decisions workshop on Thursday, May 17th , 2018 from 12:00 PM – 1:00 PM at The Kingsport Chamber. The training is co-sponsored by the Kingsport Office of Small Business Development and Entrepreneurship (KOSBE), the Kingsport Chamber and the Knoxville TVA Employees Credit Union. This is NOT a Sales Pitch but the focus will be on information and education, empowering attendees to make smart financial decisions. This is a free training, but pre-registration is required. A light lunch will be served to the event attendees. Please RSVP online at https://clients.tsbdc.org/workshop.aspx?ekey=10380022 or to Aditi Bhave at 423.392.8825 or abhave@tsbdc.org. The cooperative agreement between KOSBE and East Tennessee State University is partially funded by the U.S. Small Business Administration (SBA). SBA's funding is not an endorsement of any products, opinions or services. SBA funded programs are extended to the public on a non-discriminatory basis. Additional funding is provided by the Tennessee Board of Regents and the state of Tennessee. Reasonable accommodations for persons with disabilities will be made if requested at least two weeks in advance. Please contact Aditi Bhave — 423.392.8825; abhave@tsbdc.org; 400 Clinchfield Street, Suite 100, Kingsport, Tennessee 37660. The Tennessee Small Business Development Centers Network, hosted by Middle Tennessee State University in Murfreesboro, TN, is an accredited member of the National Association of Small Business Development Centers and funded in part through a cooperative agreement with the U.S. Small Business Administration, participating universities and community colleges, and regional support partners. All SBA programs are extended to the public on a nondiscriminatory basis. All opinions, conclusions, or recommendations expressed are those of the author(s) and do not necessarily reflect the views of the SBA and other program sponsors. All information is deemed reliable, but not guaranteed. All information, events, and/or prices are subject to change or withdrawal. The Tennessee Small Business Development Centers Network shall not be held responsible for any typographical errors, misinformation, or misprints. Please confirm the information with the listing party.